Special Containment Procedures: Because of the minor amounts of radiation surrounding SCP-1XXX, radiation warning signs are to be set up within a 1km radius of the containment site. The location is to be kept under constant surveillance and guards equipped with automatic weapons and dosimeters are to be stationed at the structure's entrances. Foundation employees in the French government are to forbid settlement of the area within 2km of SCP-1XXX. The site is to remain confidential. D-class personnel sent into the building must be forbidden from opening the reactor core's housing. Experiments on the surrounding machinery and components of the reactor must be approved by O5 personnel. SCP-1XXX's radiation output is to be monitored daily in the case of a reactor meltdown. Description: SCP-1XXX is an abandoned nuclear power plant near █████, █████. It was scheduled to be decommissioned starting May 29, ████, but following the disappearance of over a dozen nuclear scientists and inspectors, the Foundation took ownership of the site as a fake corporation and announced that the reactor would be decommissioned. Foundation employees in the French government then erased all records of the plant from nuclear databases. From the outside, SCP-1XXX appears to be a nuclear fast-reactor plant. Some of the building's walls have been vandalized by anti-nuclear protesters in 1994 according to the previous owners, leading to the installation of a barbed-wire fence to keep intruders out. When entered by a human being, SCP-1XXX will generate and link rooms as the subject proceeds into the building, and recreate previously entered rooms to reroute subjects attempting to escape. The new floor plan is unique to each visit, and multiple visits may occur simultaneously, with additional new rooms being generated for the text subject. The rooms that are generated tend to create routes leading to the reactor's core room. The new rooms include offices, hallways, and vaults. Each room contains a black spherical security camera affixed to the ceiling, which rotates to track subjects that walk into SCP-1XXX. Photograph of SCP-1XXX's core taken by D-1XXX-4. When nearing the core (after spending a time between around fifteen minutes to a number of hours searching the building), subjects equipped with dosimeters report an increase in radiation levels approaching the core, translating over time into radiation poisoning ranging from mild to severe. Notably, there is a lack of radiation shielding isolating the core room from the rest of the building, as would be expected from a professionally designed power plant. Subjects that survive the radiation and enter the core report intense Cherenkov radiation emitted from the core and surrounding equipment. At this point, most subjects will ignore orders and attempt to escape from the control room due to panic and symptoms of radiation poisoning. Escape attempts will lead to the generation of new dead-end rooms, which generally appear as medical wards or storage vaults for various items such as coolant containers, equipment, and wearable shielding. 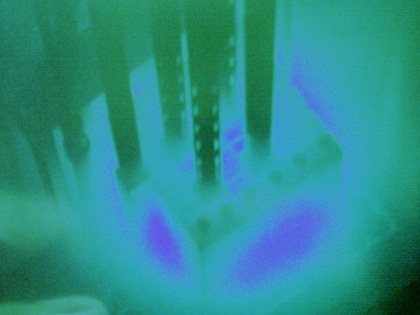 Using the additional items, some subjects have attempted to shut down or manage the reactor, but so far all attempts to change the core's state have failed for reasons including radiation, temperature, electrical hazards, mechanical accidents, and on one occasion, an explosion releasing teal gases accompanied by a comparatively large radiation spike from the entire structure when the core was exposed, resulting in the annihilation of personnel and equipment within the plant. Since then, additional safety precautions have been adopted and D-class personnel equipped with welding tools have been employed to repair and seal the core's housing to prevent further incidents.